Watch out for the earnings avalanche! 1. Earnings: Quarterly results are due to come thick and fast Thursday. This morning, we'll hear from industrial giants, airlines and food firms, including 3M (MMM), Caterpillar (CAT), American Airlines (AAL), Jetblue (JBLU), Southwest (LUV), Dr Pepper Snapple (DPS) and Dunkin Brands (DNKN). Additionally, General Motors (GM), Comcast (CCV) and Under Armour (UA) will report. Janus Capital (JNS), which has just welcomed ex-Pimco star fund manager Bill Gross, will also report earnings before the bell. There's more to watch after the close of trading. Tech heavyweights Amazon (AMZN) and Microsoft (MSFT), and famed casino giant Wynn Resorts (WYNN) will also be releasing results after the closing bell. But that's not all! European bank Credit Suisse (CS) just reported better-than-expected third quarter results. Shares were edging higher in morning trading. 2. Buffett's bad week continues: Warren Buffett just can't seem to catch a break this week as another big investment hits the skids. British grocery chain Tesco (TESO) just revealed a bigger-than-expected £263 million ($421 million) profit hole due to an accounting bungle. Its sales in the first half were also down. Buffett, through his investment company Berkshire Hathaway (BRKA), owns a significant stake. Shares in Tesco fell by 5% in London. They're down 48% so far this year. Buffett lost $2 billion in the first two days of this week on investments in IBM (IBM) and Coca-Cola (KO). 3. 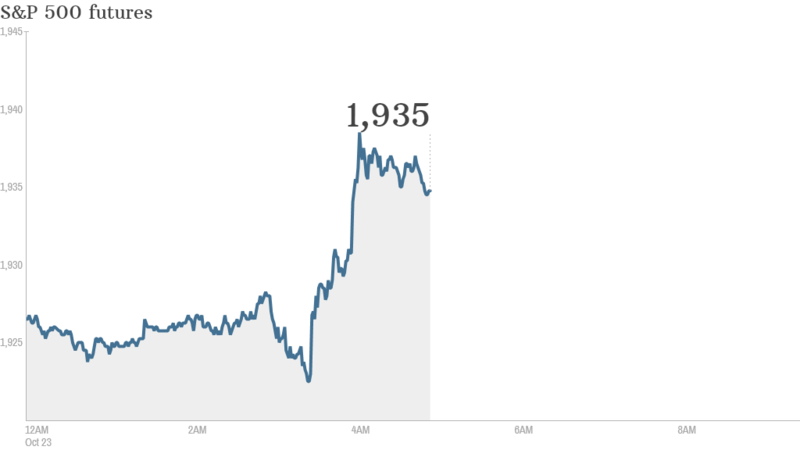 Market moves: U.S. stock futures were pointing higher ahead of the open. The major indexes all fell by nearly 1% over the previous trading session. European markets were mixed in early trading, while Asian markets ended with losses. China's purchasing managers' index for October showed manufacturing picked up a little compared to September, though investors were disappointed by a comment in the HSBC/Markit report saying "the economy continues to show signs of insufficient effective demand." In Europe, the flash PMI for October showed the manufacturing and services sectors were generally stable. But survey compiler Markit noted that the stable performance was the result of companies slashing prices to boost sales. 4. Economic data: The U.S. Department of Labor will be releasing data on weekly jobless claims at 8:30am ET.